Day 3 the theme is Breakfast. I am not really that fond of breakfast, I really hate cereal. But I force myself to have something as I know it is the most important meal of the day. My breakfast usually consists of freshly squeezed orange juice and always something spread with good old Vegemite. 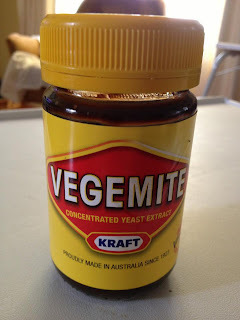 For those non Aussie's out there or those who have never tasted Vegemite, it is made from concentrated yeast extract and is very black and very salty. Most non converts that I have given it to absolutely hate it. But being Australian it is probably one of the first food experiences we get. Most Mums steer for Vegemite on toast when their child is a very fussy eater. I haven't had a chance to do get into to much today as I am going to a wedding and at 59 it takes me a while to scrub up OK. But I have been researching Tourist Parks for our first 3 nights. I am also excited to have actually booked our first night. All this preparation is making it feel really REAL!! Vegemite (Or marmite) - couldn't live without it. It's not available in Spain so whenever anyone from the UK visits we ask them to bring a jar. Being veggie is such a necessity for cooking as well as for spreading on toast. Vegemite is disgusting! LOL I tried it my first morning in Adelaide and if I wasn't eating in a public place I would have spit out my toast smeared with this stuff! I put it on my toast as I would jam and I've since learned not to do that, mind you I'll NEVER even taste the stuff ever again so no worries there! lol Definitely an acquired taste on this one. Yipeee, the first night is booked and for sure it's getting real for you now, it's getting closer by the day! Have a wonderful week Davine, cheers. I just love listening to other peoples opinion on Vegemite. Mark it's funny as much as Vegemite & Marmite are similar I cannot eat Marmite it tastes yucky to me. Darlene I can just imagine your face as you tasted it. When I lived in Toronto my Canadian friend Vikki had the same first reaction. Daniel thank you so much for visiting my blog.